Your list of things to see and do now includes Tanukikoji Shopping Street, Sapporo Esta, Sapporo JR Tower Observatory T38, and other attractions. Kick off your visit on the 14th (Sun): ponder the world of politics at Former Hokkaido Government Office Building, then see the interesting displays at Sapporo Beer Museum, then buy something for everyone on your list at Sapporo Esta, and finally make a trip to Sapporo JR Tower Observatory T38. Keep things going the next day: steep yourself in history at Clock Tower (Tokei-dai), enjoy breathtaking views from Sapporo TV Tower, get into the urban bustle at Sapporo Underground Pedestrian Space, then stroll around Odori Park, then take in the spiritual surroundings of Hokkaido Shrine Tongu, and finally walk around Maruyama Park. To find other places to visit, more things to do, and tourist information, use the Sapporo trip itinerary builder tool . Sydney, Australia to Sapporo is an approximately 15-hour flight. Traveling from Sydney to Sapporo, you'll gain 1 hour due to the time zone difference. Traveling from Sydney in April, you will find days in Sapporo are colder (9°C), and nights are a bit cooler (7°C). You will have some time to spend on the 16th (Tue) before leaving for Otaru. The port city of Otaru has long attracted domestic visitors, drawn in by the city's many historic buildings, and has started to garner international attention, too. Your day-by-day itinerary now includes Otaru Canal, Marchen Intersection, Kitaichi Glass 3gokan, and other attractions you added. Kick off your visit on the 16th (Tue): hunt for treasures at Sankaku Market, make a trip to Tanaka Sake Brewery Kikkogura, examine the collection at Otaru City General Museum Ungakan, examine the collection at Otaru Museum, Bank of Japan, then admire the masterpieces at Otaru Art Base, Stained Glass Museum, and finally steep yourself in history at Former Otaru Warehouse. Plan my trip to Otaru with suggested itineraries provided by Inspirock. Getting from Sapporo to Otaru by car takes about an hour. Other options: take a train; or take a bus. Expect a daytime high around 9°C in April, and nighttime lows around 7°C. Wrap up your sightseeing on the 17th (Wed) to allow time to drive to Noboribetsu. You've added Hakucho Bridge, Oku no Yu, Oyunuma, and other attractions to your itinerary. On the 17th (Wed), take in the dramatic natural features at Jigokudani, witness a stunning natural landmark at Oyunuma, take in the natural beauty of Oku no Yu, then take in the natural beauty of Oyunumagawa Natural Footbath, then make a trip to Cape Chikyu, and finally snap pictures at Hakucho Bridge. To find reviews, ratings, more things to do, and other tourist information, go to the Noboribetsu trip site . Getting from Otaru to Noboribetsu by car takes about 2 hours. Other options: take a train; or do a combination of bus and train. 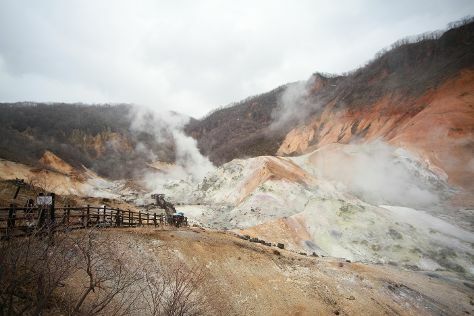 Traveling from Otaru in April, you can expect nighttime temperatures to be little chillier in Noboribetsu, with lows of 3°C. On the 18th (Thu), you'll have the morning to explore before heading off to Hakodate. Your list of things to see and do now includes Mount Hakodate, Hachimanzaka, Kanemori Red Brick Warehouse, and other attractions. Kick off your visit on the 18th (Thu): walk around Onuma Quasi-National Park, admire the landmark architecture of Goryokaku Park, enjoy breathtaking views from Goryokaku Tower, then look for gifts at Kanemori Red Brick Warehouse, then make a trip to Hachimanzaka, and finally take your sightseeing to a higher altitude at Mount Hakodate. For maps, more things to do, ratings, and other tourist information, go to the Hakodate sightseeing planning tool . Traveling by car from Noboribetsu to Hakodate takes 2.5 hours. Alternatively, you can take a train. April in Hakodate sees daily highs of 13°C and lows of 5°C at night. You will have some time to spend on the 19th (Fri) before leaving for home.